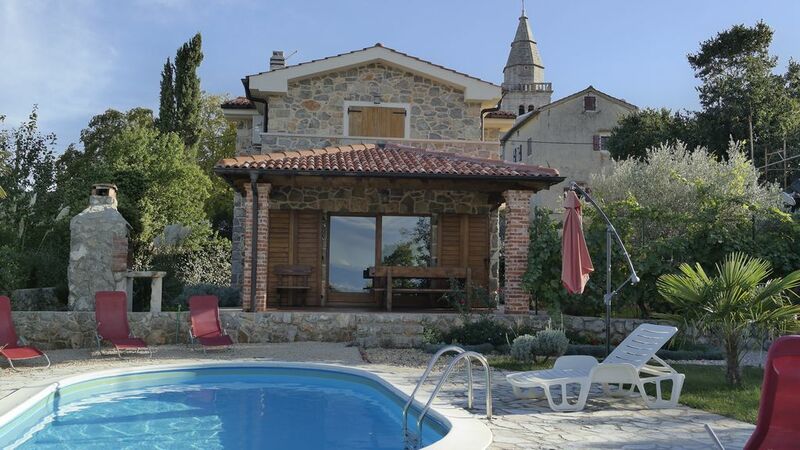 Traditional stone house with swimming pool for 6+1 persons. Villa is located in quiet village Poljica near Malinska on island Krk about 3 km from the sea. Total size of the house 105 m on two floors. On ground floor completely equipped kitchen with dishwasher, fridge, frizzier, oven, microwave and all cooking facilities. Living room joined with kitchen, sat lcd tv and extra bed for 2 persons. House has 2 bathrooms, one on each floor. One bathroom with shower and another with tube and washing machine. On second floor 3 bedrooms with 2 twin beds and 2 large double beds (possibility of baby cot on request). One room with terrace and sea view. Each bedroom with lcd tv. Villa is completely air-conditioned in all rooms. Available big terrace (covered) and private garden with swimming pool (25 m2), grill. Available wireless internet and own parking.